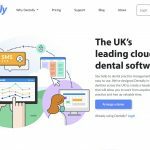 Dentally’s new website will allow you to navigate through some of their key features and find out how they deliver dental software on the market with cloud enabled tools. Just like their software, they have invested time in developing the new website, so you can quickly and easily navigate through it and find out all you need to know about what they offer. The website will allow you to see their streamlined clinical refined workflow that’s easy to manage from anywhere, to make your practice ultra-efficient. Dentally have also included some useful videos for you to view about how they integrate with the NHS and how the iPad app can help you manage patient medical history and explain treatment plans. The website takes you through all their key features from charting and conducting periodontal examinations, to tailored treatment plans and organising your time on the day, to appointments in the future. It demonstrates patient management, recalls and correspondence, and how we safely secure your data. Take a look at their smarter end to end reporting and how you can view visually pleasing reports on every aspect of your practice.